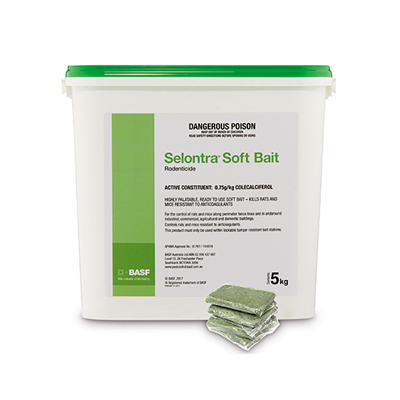 Selontra® Soft Bait Rodenticide is a highly effective, innovative rodent bait that rapidly controls rodent infestations. Selontra is powered a non-anticoagulant active ingredient and formulated into a stable, highly palatable soft block formulation. The active ingredient in Selontra is naturally occurring and is neither persistent nor bio-accumulative, resulting in a favorable environmental profile when compared to first and second generation anticoagulants.